HOW WE CAME TO LIVE HERE is a story-telling game which evokes the myths and legends of the Native American people. Within the game, characters must navigate their own ambitions and desires, the conflicting demands of their fellow villagers, and the ever-present threat of monsters and natural disasters from outside: Your own ambition could lead you down a path of corruption. 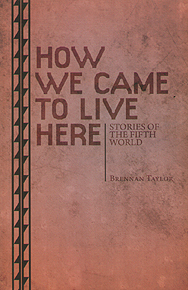 "How We Came To Live Here is a game that successfully, and respectfully, merges the feeling of a living culture with a world torn from myth, and wraps it all in a set of rules that do a great job of evoking the Fifth World at the table."